Josh Kovacs (Ben Stiller) is the type of employee that you want running your business. A tireless worker, Josh has pulled himself up from the ground floor to become the assistant manager of the prestigious Tower apartment building in New York. Josh knows everything there is to know about each and every one of the tenants and he serves as a trusted advisor for all of his employees. His most prominent tenant is billionaire Arthur Shaw (Alan Alda), a proud New Yorker who Josh has developed a friendship with. But when Shaw is indicted for fraud and accused of bilking his clients out of hundreds of millions of dollars, Josh is forced to tell his employees that their pensions accounted for some of the stolen funds. With desperation seeping in, Josh learns that Shaw has a $20 million “security blanket” tucked away somewhere and becomes convinced that it’s hidden inside The Tower. Josh puts together a rag-tag team that includes his brother-in-law (Casey Affleck), a DeVry drop out (Michael Pena), a former stock broker (Matthew Broderick), and a small time crook (Eddie Murphy) and formulates a plan to reclaim the cash and provide justice for those who Shaw wronged. There are moments within Tower Heist in which you almost (ALMOST) find cause to get on board and enjoy the ride. Stiller gives a quality, understated performance that probably deserves a little more attention than it’s going to receive. He gives Josh a little more authenticity than I expected and that serves his character well. Likewise, you can never go wrong with Affleck, who always manages to steal just about any scene he’s in. The plot is timely and interesting and that shines through from time to time, illustrating why the very talented cast signed on in the first place. 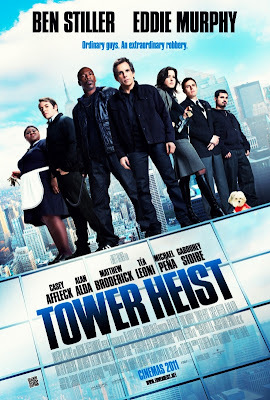 And there is an undeniably fun energy that runs through Tower Heist which continually tries (unsuccessfully) to keep the movie’s pulse high while encouraging the audience to get involved with the storyline. Unfortunately, that’s where the positives stop. In fact, for my money, Tower Heist is the true definition of sloppy filmmaking. But then again, what else should I expect from director Bret Ratner? Throughout his time in Hollywood, Ratner has spent far more time making a fool of himself than he’s ever spent actually working on his craft. He’s a guy who enjoys being famous far more than he does making movies. None of his movies are particularly good and most of them are downright awful and despite the fact that he usually works within the action-comedy genre, he’s still unable to figure out how to carve out any sort of a positive niche for himself within said genre. Even Michael Bay has perfected the special effects shot, creating occasional moments of visual brilliance in each of his films and giving audiences a reason to come back for more despite the fact that he has no understanding of dialogue, plotlines, or casting. Ratner can’t even do that; instead, all of his movies are a hodge-podge of haphazard stupidity. Every aspect of Tower Heist reeks of indifference and laziness. Plot holes abound, ridiculous actions are accepted as totally reasonable, and the dialogue is often to the level of a fourth grader. Basically, Ratner doesn’t know how to effectively tell his story and so any part of it that you might enjoy is painted over by absurdities and general stupidity. He routinely traps his actors in corners that they can’t get out of and thereby wastes their talents. Murphy in particular seems like he’s stuck in glass box acting out his greatest hits from his former glory years, almost like a caricature of himself. Is he funny? I guess, but not in the laugh-out-loud way that he’s trying to be. That doesn’t stop with Murphy, however. There are shockingly few truly humorous moments within Tower Heist and that leaves it feeling overly long and even dull at times. It’s as if Ratner was under orders to shoot, edit, and ship this movie in 30 days and paid no attention to little details like, you know, a cohesive storyline and jokes that actually make the audience laugh. All of this makes Tower Heist a disappointing, waste of time.